Inventory We are a resale marketplace, not a box office or venue. Ticket prices may exceed face value. This site is not owned by Dow Event Center . 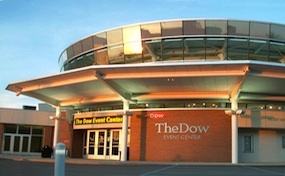 The Dow Event Center (formerly known as The Saginaw County Event Center, formerly known as The Saginaw Civic Center) is located in downtown Saginaw, Michigan. The center consists of three parts: Heritage Theater, a meeting facility formerly known as Unity Hall, and Wendler Arena, an ice rink. It also houses the OHL junior ice hockey team named Saginaw Spirit. In 2008 served its first year as host to the Indoor Football League's now defunct Saginaw Sting. The facility has housed a number of hockey teams in the past, such as the Saginaw LumberKings, Saginaw Wheels and both the IHL and UHL incarnations of the Saginaw Gears. CenterSaginaw.com is not affiliated with any primary box office or supplier. We are a privately owned and operated business specializing in sales in the secondary market. To buy tickets for any Dow Event Center events in Saginaw simply click on the event of interest or call our operators at anytime.